A few days ago I decided to head down to Denmark in the hope of finding a new painting location. I got distracted along the way and ended up driving down some back tracks for a few hours. It was cloudy, so I didn't mind too much as I still find cloudy days difficult for painting plein air. And I did find some nice areas of filled with wildflowers and some interesting places for future reference. I eventually made it to Lowlands Beach. The surf was "pumping", more than I'd seen it here before, but it was too late to start painting so I just wandered around with the camera and took it all in. Yesterday was fine and warm so I headed back to Lowlands Beach. I stopped to take a look at the Youngs Siding General Store because it looks like something I might want to paint. 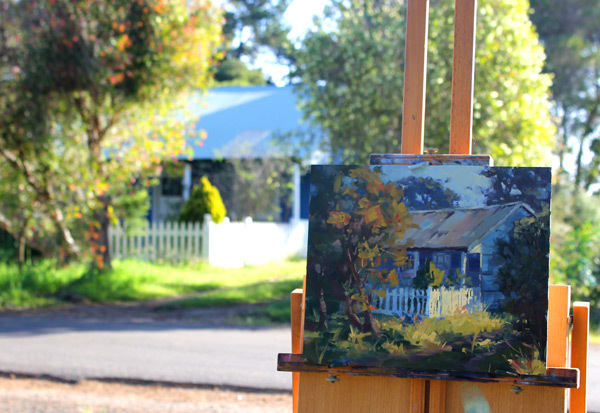 While I was staring at it, and tossing up the possibility of painting it, I noticed a small cottage to my right. The sunlight was hitting it hard - I got the easel out and got to work. I made a couple of "executive decisions" on this one. The cottage had a fairly new roof, but I chose to make it older. 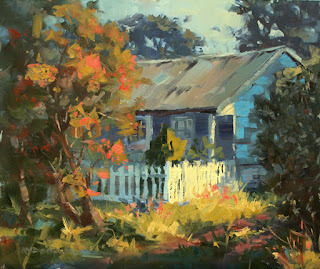 The shrub on the right is much bigger than I painted it - you can see it in the location shot. I wanted to see a bit more of the roof so I pruned the shrub down a fair bit. I'm happy with both decisions. It was still fairly early, so I packed up and continued on to Lowlands. 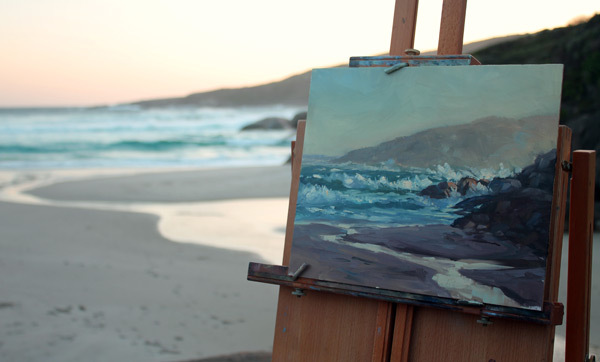 This time I took my easel with me, down the steps to the beach. So there was no excuse not to paint something. It took a while to decide which way to face. I sat and stared and wandered around for quite a while before settling on this view of the semi-permanent creek that flows out of the sand dunes, down to the ocean. I used a limited palette and almost threw the paint on the primed panel. I think there's about half-an-hour's work here - no time for major "executive decisions". 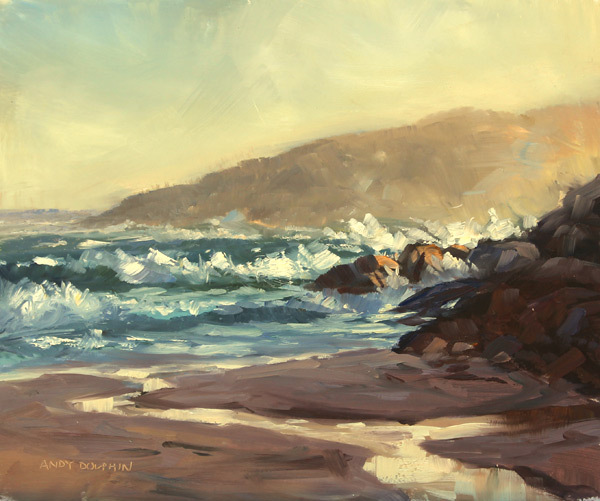 I'm happy with the feeling of light in this sketch, especially the glow behind the foreground rocks and across the breakers. They were my combined subjects. If I had a little more time, I'd try to do something with the "lump" of rocks on the right. Next time.